Q1. What is the boat club about? The concept of our boat club is to offer an easy alternative for people to adopt a boating lifestyle without the worries and troubles. Xclusive Boat Club provides you with unlimited access to a brand-new fleet of boats for you to experience without the charges and commitment of ownership. There is no need to worry about maintenance, cleaning, berthing, insurance or registration cost – we take care of everything. Q2. How do I join? All you need to do is email us: info@xclusiveboatclub.com or call +971 4 566 8022 and schedule a viewing, we will meet you, show you our fleet and give you a 30 minute trial. Q3. How many boats do you have? The Xclusive Boat Club membership cost is substantially less than the average cost of owning a boat! Get in touch to get more information on our different membership packages and we will cater for your specific needs. Q5. Can anyone become a member? Members must be at least 25 years of age. Q6. Where are you located? Currently in Dubai Marina only. The next locations will be on the Palm, Marasi Business Bay and Yas Marina. Q7. Do I take the boat out myself or do you provide a captain? Members can take the boat themselves and do not require one of our captains to skipper the boat. Captains are available upon request at no additional cost throughout your entire membership, subject to availability. Q8. What type of boats do you have? We have a variety of boats ranging from mini yachts to wakeboarding boats, bowriders and fishing boats. Q9. How many locations do you have? We are currently operating from Dubai Marina but plan to add new locations over the upcoming seasons. Q10. Where can I take the boat? There are no restrictions, as long as you bring the boat back in time. Various anchoring locations and permitted driving zones will be briefed to you during the training sessions. Q11. Can I drive inside the Palm Jumeirah area? No! You are permitted to drive only outside the Palm Jumeirah areas. Various anchoring locations and permitted driving zones will be briefed to you during the training sessions. Q12. What is the maximum number of passengers I can take in one booking? The number of passengers depends on the booked boat’s capacity. Q13. What if I arrive and the boat is unable to start? It’s our priority to ensure that all of our boats are well maintained have no mechanical issues. Preventive measures are taken to avoid such circumstances. Q14. What if I damage the boat? You are Insured! If a member causes damages under AED 5000, they are responsible for covering such damage. If the amount of damage exceeds AED 5000, then the member pays a maximum of AED 5000 towards the insurance. It is required of the member to provide all necessary documentation within 72 hours of the incident to support such a claim including but not limited to; a police report, copy of DMCA issued license, Emirates ID copy, and a detailed explanation of the events leading to the damage. In addition, if damage has occurred to interior or exterior due to any kind of negligence then the member is responsible for such damage. The damage will be reviewed, and the cost of repair will be sent to the member. Once the payment for the damage is settled then the membership will be resumed. Q15. Do I need to be an experienced captain to join the club? No prior experience is necessary or required. We will coach you, train you, and empower you to enjoy boating as much as we do. Q16. Who cleans the boat? All XBC boats are professionally maintained and repaired by certified marine technicians. Additionally, each vessel is thoroughly cleaned and inspected so it will be ready for you to enjoy. Q17. Is Xclusive Boat Club Licensed? Yes, the club is licensed under Dubai Government and regulated by the Dubai Maritime City Authority. Q18. How do you qualify members? Membership is open to boaters of any skill level, 25 years of age and older. 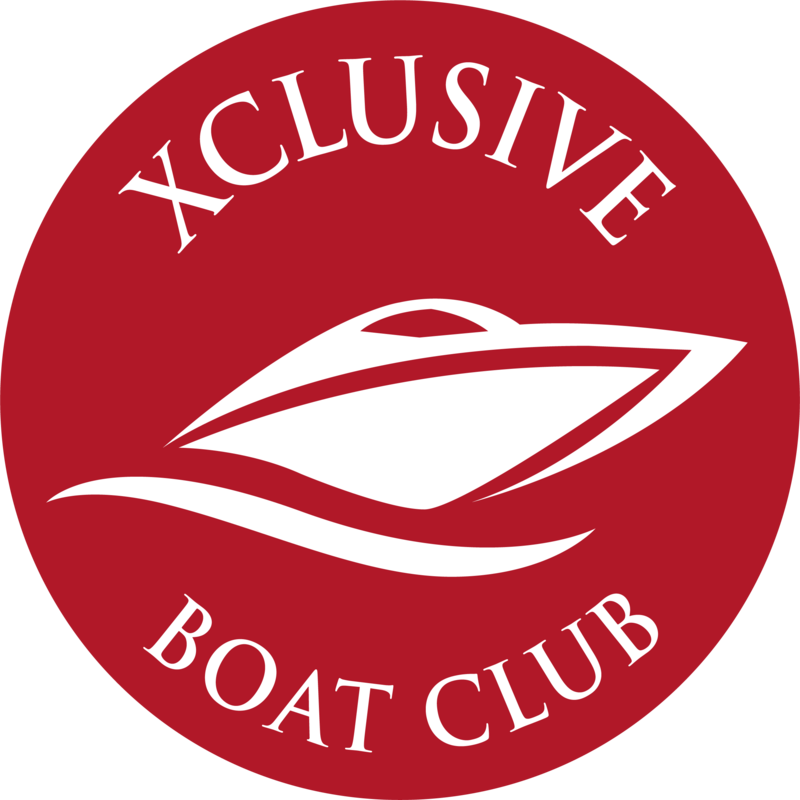 Whether you’ve never boated before, or you’ve boated for years, Xclusive Boat Club welcomes you as a member! Q19. Are corporate memberships available? Yes, please contact us for more information on corporate memberships and we will tailor membership to your specific needs. Q20. How long does the membership last? Memberships last for a full calendar year. Q21. Are your boats New or Pre-Owned? Our boats are purchased brand new and we plan on replacing them every 3 years. Q22. What happens after the membership term ends? The member has a choice to renew their membership or cancel their membership, in both cases we will need 1-month prior notice in writing. For renewal, you will only need to pay the membership fee. You will be eligible for renewal based on all previous dues paid. Q23. What makes us different to other boat clubs? Q24. Why should I join? Q1. How do I book a boat? You can make booking through our online booking system via desktop or mobile. You will receive an instant confirmation of the booking. Q2. How do I cancel a booking? All booking cancelation to be done before 18:00 on the previous day, online or through the reservations manager. Q3. How many reservations can I have at one time? Can I book a boat every day? You can have a maximum of 2 bookings at any given time, and once your first booking is used, you can make your next booking immediately. Q4. Can non-members rent your boats? No! A member must be present. Q5. How can I confirm boat availability on the weekend? Weekend Availability – we are transparent about how we are capable of offering this – we limit our membership in relation to the number of boats we have, and each member is only allowed to make 1 booking on the weekend to offer a fair usage policy. E.g. If we have 10 boats and 6 booking slots on Friday & Saturday (morning, afternoon, evening), then we have a total of 60 slots on the weekend. As we limit our membership, this allows us to offer every single member a booking on the weekend. Additional bookings on the weekend are allowed and are subject to availability and approval from the reservation manager. Q6. What does advance booking mean? You can book two slots at any given time. For example, if you have booked Monday and Tuesday then you can only make your next booking once you have completed your Monday booking. Q7. Can I book a boat on the same day? Yes, bookings on the same day is subject to approval by reservations manager. Q8. Do you provide with pick-up-drop services? Q9. How quick can I start using the boat? You will have to make payment and submit all the necessary documents (signed contract, passport, visa, EID, DMCA license and a photo for your membership card) first. Bookings can be made only on completion of orientation. All the above processes can take 3 – 7 days. Q10. How long does the DMCA card process take? If you go early in the morning it can take 30 mins, otherwise it can take up to 3 days. Q11. How many slots can I use in a day? You can use 1 slot a day. Q12. Can I book on a public holiday? Q13. What are the booking timings for each slot? Q14. What happens if I don’t show up for my booking? Booking cancelations must be made before 6:00 pm on the previous day, otherwise there will be a penalty of AED 500 for no shows. Q15. Can I return the boat later than the arrival time? No, there are other members who would have made a booking after your slot. And the boat club has to ensure that the boat is thoroughly checked and cleaned before its next trip. In such events if you are later than 15 minutes we will charge you AED 500 late fee. Repeat offenders would subject to suspension. Q16. Do I need to return the boat back at the same departure point? Q17. Do I have to pay for the fuel consumed by myself? Q18. Do I have to refuel the boat myself? No, you don’t have to refuel the boat yourself; however, you will have to pay for the fuel that you have consumed. Q19. Can I go deep sea diving? No, Deep Sea diving is prohibited in the permitted anchoring zones. Q20. Can I go spearfishing with my own equipment? Q21. Can I do water sports activities such as wakeboarding, tubing, wake surfing etc.? Yes, you can enjoy the water sport activities. Q22. Do I have to wear a life jacket while driving the boat? Adults do not need to wear a life jacket, but we do encourage that you wear one at all times, any children under the age of 6 must wear a life jacket at all times. Q23. Can I carry food and beverages? Q24. What locations in Dubai can I beach the boat? You are not permitted to beach the boat at any of the Dubai locations. Q2. What are the benefits? Q3. Do you offer boat training and classes? Yes, we do train our members on power boat driving and provide extensive training on our fleet and emergency response plans. We have our own in-house Sea School and offer the RYA Power Boat Level 2 license which allows you to skipper a boat up to 12 meters anywhere in the world. We also provide unlimited free training bookings with our qualified instructors. Q4. What if I hold a Pleasure Marine license issued by DMCA, would you reduce the joining fee? Q5. Do you have full-time staff? Yes, and we would be happy to help you. Q6. Do you provide fresh towels? Yes, we will provide fresh dry cleaned towels for however many guests are on board. Q7. Do you provide water and ice? Yes, we provide enough bottled water and ice for the capacity of the boat. Q8. Will my dues increase year to year? Our membership rates are subject to increase after your first renewal year. Q9. Is insurance included in my membership? What if an accident took place? We provide full comprehensive insurance for the boats and all passengers on board in case of any accident or collision. Q10. Are there any usage charges? Q11. Are there any hidden expenses? Q12. How long are joining benefits valid for? They are valid for the initial term of your contract. Q13. Do you provide us with a wakeboard, fishing kit, ski, tubes, and other equipment? Yes, at an additional cost of AED 100. Q14. Do you provide soft drinks? No, we do not provide soft drinks. Q15. Do I need my own cooler box? We provide you with a cooler box filled with bottled water & ice so if you would like to bring any additional drinks or snacks you may do so. Yes, depending on the size of the dog and subject to approval from management. Q3. Can I use the boat to teach people? No, commercial purpose is strictly prohibited, and will be in breach of contract. Q4. What if I have fines for speeding? You must settle all fines directly with DMCA. Q5. Can I drink and drive? Q6. Can my guest use the club boats without me being there? Q7. Can I let my friend drive? No, only the registered member of Xclusive Boat Club can drive the boats. Q8. Is the membership fee refundable? Only after 5 months of the membership, the member can terminate his/her membership after giving us a months’ notice. Any membership amount that is owed will be reimbursed without penalty. The joining fee is non-refundable. Q9. Can I go 50/50 with my friend? We have different membership options, please contact us to find out more information. Q10. Can I make overnight bookings? Q11. Am I able to cancel my membership? What is the procedure? Only after 5 months of the membership, the member can terminate his/her membership after giving us a months’ notice in writing with no penalty. Q12. If I have a DMCA license, can I make a booking and use your boat? After you have successfully processed all the necessary documents and you have received your membership card. Q13. Do you rent your boats? Q14. Where can I throw the garbage? The garbage must be discarded at the marina. Q15. Are children allowed on the boat? Yes, children are allowed on the boat provided they are accompanied by an adult. Children under the age of 6 must wear life jackets. Q16. What is the age limit for children to be on the boat? There is no age limit for children, however, we do advise parents to ensure that their children are safe on board at all time; children should wear the appropriate life vest. Q17. How many people can come on the boat? Members should not exceed passenger capacity of the booked boat (capacity mentioned on the boat). Q18. Can I barbeque on the boat? Only in specific boats which have a barbeque provision. Members are prohibited to bring coal onto the boat. Q19. Can I wear my footwear in the boat? What kind of footwear is permitted on the boat? No footwear is allowed in the cabin area. Slippers will be provided for use. Q20. Is smoking allowed in the boat? Smoking is prohibited in the cabin area. Q1. What safety equipment is on the boat? Fire extinguishers, Life Jackets, Life Buoys, Emergency Transponder Unit, Life Rings, First Aid Kit, Fire alarms. Q2. What if the boat stopped in the middle of the sea? All of our engines are in new condition, and they are regularly maintained. However, if anything goes wrong, the emergency action will have been explained to you in the training module, and all members should contact the emergency number on the boat immediately. Our staff will rescue you. Q3. Do I have to take mandatory training before I join? There is mandatory induction training where will show you how to use all different types of boats. Q4. Who will give me induction training? Our Qualified Trainer will provide you with hands on training on basic boat operations and maneuvering. Q5. What if I get stopped by coast guard? If you are stopped by the coast guard, please stop and follow their instructions. Q6. What if the weather is bad? We provide (Coast guard approved) updates on weather; the Club is not responsible for sudden and unpredictable changes. If the coast guard prohibits from boating, the message will be conveyed to you and you will not be permitted to drive the boat. Q7. What do I do if I have met with an accident? Call the club supervisor or manager and we will support you on next steps. Q8. Can we anchor and swim in the sea? Yes, only in the permitted anchoring zones. Q9. What if there is an accident between two members of the club while using the club boats? We request either of the members to call the club supervisor/manager immediately and report the incident. The member who caused the incident will be penalized. Your account will be suspended until due notice. If a member causes damage under AED 5000, they are responsible for covering such damage. If the amount of damage exceeds AED 5000, then the member pays a maximum of AED 5000 towards the insurance. Members are required to provide all necessary documentation within 72 hours of the incident to support such a claim including but not limited to; a police report, copy of DMCA issued license, Emirates ID copy, and a detailed explanation of the events leading to the damage.